Do you wake up with puffy eyes? I've heard all kinds of treatments, from cucumbers to refrigerated green tea bags. If you'd like a simpler, bottled solution, Youngblood makes a great eye cream with a noticeable cooling effect: Eye Impact. 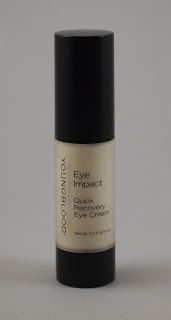 Youngblood's Eye Impact is an gentle eye cream with a nice cooling effect. It seems to provide an effective remedy for puffiness. I love the light texture, which allows it to be used in the morning under eye makeup. If I were to improve this product, I would remove the retinyl palmitate. Also, the $46 price point may be prohibitive to some buyers. However, I would recommend it for those looking for a more natural eye cream with a cooling effect.